Credit: By Johan Larsson on Flickr. Some rights reserved. People want to stay informed about what is happening around the world or in their community, but it can be hard to filter the large amount of information available online. This is where news aggregation apps come in – an easy way to consume relevant news available in one place on a mobile device. While they might be regarded with slight skepticism by news organisations who are putting considerable time and effort into developing their own news apps, ultimately, they are an alternative distribution channel for news. 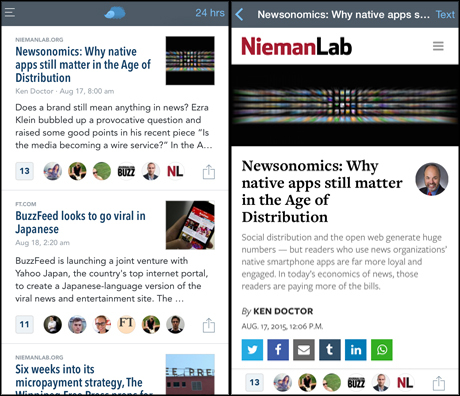 Here are five free news aggregation apps that will make staying updated easier. Nuzzel was developed in 2012 as a website that allowed people to browse the news their Twitter and Facebook friends shared on the platforms, but the San Francisco-founded app has gained worldwide momentum and has also become quite a staple among journalists. Nuzzel aggregates articles shared by either people the user follows on Twitter, their Facebook friends or both and tells them how many people have shared it and who they are, as well as enabling them to read the full article without requiring external navigation. In terms of personalisation, the app offers a number of elements: it can be set up to display articles according to how recent they are or according to how many friends have shared it. Alerts work in a similar way – the user decides when they want Nuzzel to send a push notification to their device, according to the number of people who've shared a link and there is also an option to set the maximum number of alerts the app can send per day, if you don't want to be flooded with push notifications. 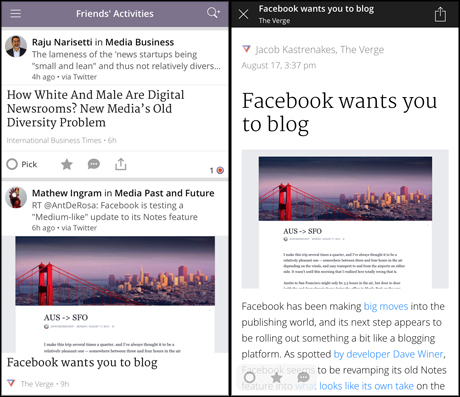 Nuzzel aims to give a comprehensive overview of relevant news, so it also lets user alternate between feeds, including news from their friends, their friends' friends, news they may have missed and custom feeds, which is content shared by the person's Twitter lists. Trove was originally developed by the Washington Post Lab as a personalised news service, but in January 2014, it was revamped to include curation and further personalisation features. The app curates stories from friends, but also enables each user to become a curator by creating 'troves', or topic streams and adding relevant content from anywhere on the web. If someone thinks an article in a trove is interesting, they can use the 'pick' button to highlight and add it to their own trove. Users can also edit their curated troves, by adding or removing specific topics and Trove's advice is to be as specific as possible about a subject stream to make sure the content of a trove is relevant. Active user curation aside, Trove also has a group of editors who choose the stories they think are important in its 'latest headlines' section, which could serve as inspiration for new troves or to kickstart a conversation around a particular topic. Blockfeed launched earlier this month and, as opposed to the previous two apps, it uses geolocation to bring forward hyper local news and strengthen communities. The app describes itself as “a magic newspaper that rearranges its front page to show the news near you” and it is currently only available in New York City. Blockfeed doesn’t only aggregate content from established publishers, but also from bloggers and local publishers whose content sometimes gets buried under the bigger, more well known news sources. The geolocation feature goes into as much detail as curating news from a particular neighbourhood or street and the content is then shown to the reader based on the location they’re in when opening the app. The number of shares is also a factor on Blockfeed, with articles gaining more relevance according to the number of times they’ve been shared. We have written in the past about card-based storytelling and how some news organisations are using them to provide context around stories on the web. Wildcard was developed last year as a “browser for the mobile age”, but got a redesign earlier this month in the shape of an app that combines different sources and types of content to put together a story. 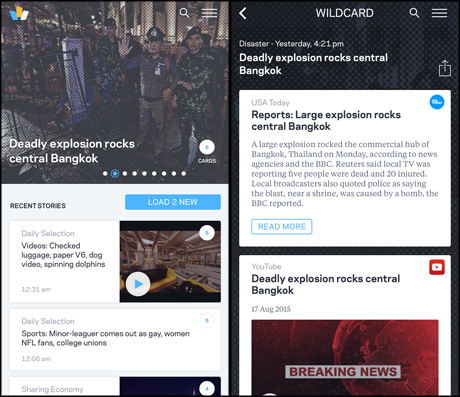 For example, yesterday’s news on a deadly explosion in central Bangkok was told in eight cards, including: an aggregated text article from USA Today, footage from YouTube video and a tweet from Vice News, which can be shared individually or as a collective story. News is curated and summarised by a team of editors, but users can personalise their feed by linking their Twitter account, as well as search for individual topics and suggested trending stories. A particularly useful feature is the ability to save cards even if no internet connection is available. inshorts is a new app based on the premise that people don’t always have the time to read lengthy articles to understand a story, so its aim is to deliver news in less than 60 words. The app groups news into categories, such as business, politics and technology and displays articles in a similar card design. Readers are presented with an image and a short summary, but they can ‘flip’ the card to read the whole story within the app if they wish to. Flicking up on the screen will take users to the next story and a single tap on the article’s headline will bookmark it for later. There is also a comprehensive list of social media sharing options and an ‘unread stories’ category. However, for now, users can’t personalise their news stream as the stories are handpicked by a team of editors. 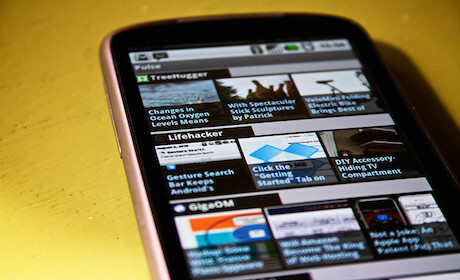 Are there any other news aggregation apps that you use? Let us know in the comments below or tweet us @journalismnews.